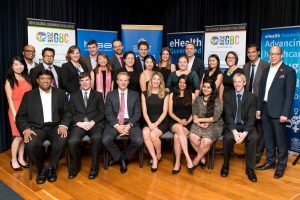 HISA members were in attendance at the finals of the Global Business Challenge 2016 last week in Brisbane. GB2016 is a global business case competition aimed at developing solutions to global problems. It is a joint initiative of QUT, UQ and Griffith Universities supported this year by AusIndustry, Queensland Health and HISA as government and industry supporters. The problem nominated this year was in healthcare to design solutions to improve the effectiveness and cost of healthcare outcomes in isolated communities. Teams come from across the world including finalists from Germany, India, Malaysia, England, Canada and Australia. Solutions proposed addressed new business services models, community enablement and technology enablement and reflected different perspectives and thinking from international thinking and backgrounds. 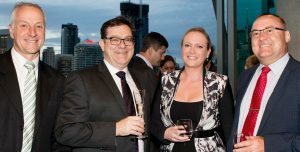 Winners were awarded significant monetary prizes and opportunities with one team being selected specifically by Queensland Health to work with them to implement the solution proposed. Greg Moran (HISA), David O’Driscoll (ADHA), Courtney Brown (AAF) and Joe Griffiths (Capita) at the finals night.